One article was written by a Christian, the other, not reprinted here, by a Mormon. Lynn K Wilder served in the Mormon Temple and as an LDS professor in Utah. She explains what convinced her to leave. During my 30 years as a Mormon, I sincerely believed that mystical ‘spiritual experiences’ aligned me with my heavenly Father, Jesus and the Holy Ghost (I believed in three separate gods, but no Trinity) in the Church of Jesus Christ of Latter-day Saints (LDS). When a patriarch laid his hands on my head to give me a blessing, complete with Jewish lineage, I felt something like electricity course through my body. I was frequently overcome with emotion serving as an ordinance worker in the Chicago Temple or as a professor at the Church’s leading education institute, Brigham Young University. I bore testimony that Joseph Smith restored ‘the only true and living Church’. Sincerely, I trusted feelings that flowed from these experiences, not aware that they might be counterfeit; rooted in what the Bible calls ‘another Jesus’ who teaches ‘another gospel’. Today, I neither trust feelings alone nor the sought-after visitations of spirits in the temple as fitting measures to test truth. One must also engage the brain and read the Bible. While he was a Mormon missionary, our third son, Micah, read the Bible several times, eventually challenging his Mormon family to do the same. Like cold water in my face, I was stunned to find profound doctrinal conflicts between the Bible and the LDS scriptures. I felt something like electricity course through my body. The Bible clearly teaches that salvation is a free gift. One crosses from death to life instantly upon believing in the one who paid for my sins on the cross. There was no waiting until the end of my life to see if I had done enough. 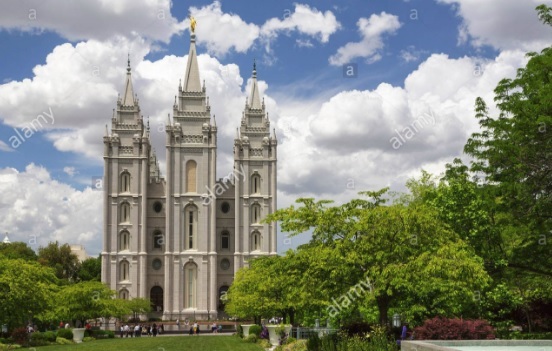 No Mormon temple works – whose signs, tokens and handshakes are actually Masonic – are required for eternal life. Jesus himself said: ‘One greater than the temple is here’ (Matthew 12:6, ASV). Which Jesus was I to believe? According to LDS teaching, the Mormon Jesus was born as the first spirit child of a probable heavenly mother and heavenly father. This Jesus is a created being. He was not a god initially but earned his way to deity over time. The second spirit child was Lucifer. Both brothers presented their plans to the Council of the Gods for the future salvation of those on earth. Jesus’ plan was accepted, while Lucifer took a third of the host of heaven and was cast down. Then came the rest of us. Men might one day earn godhood. Women bear spirit children throughout the eternities as queens and priestesses to their husbands. None of this matches the biblical account, where Jesus is God and Lucifer is a fallen angel. Indeed, the greatest lie Satan fed us in the garden was that we could be ‘like God’, yet this is what Mormons believe. There was no waiting until the end of my life to see if I had done enough. No Mormon temple works – whose signs, tokens and handshakes are actually Masonic – are required for eternal life. There are other important ways in which Mormon teaching does not match biblical teaching on Christ’s atonement, but most significantly the Mormon Jesus teaches that membership in the LDS Church is required for eternal life. According to the Bible, his Church is a body of believers. No organisation can save. IS THE LDS CHURCH BECOMING CHRISTIAN? So, has the Mormon Church rescinded its most pernicious doctrines? Not really. According to LDS scripture, polygamy is an eternal principle and dark skin is a curse. Although many do not know or accept these teachings, they are still presented in their scriptures, in official Church manuals and in the sacred temple. The official Church website portrays these books of Mormon scripture as ‘pure truth’ and ‘utterly reliable’. Women bear spirit children throughout the eternities as queens and priestesses to their husbands. Although polygamy is no longer practised physically in this life, if a first wife to whom a man is ‘sealed’ (in marriage for this life and the next in the temple) dies and he is sealed to a second, he expects to be married to both women in the hereafter. In 1978, LDS prophet Spencer W Kimball reported a revelation from God. Blacks could hold the priesthood. All who were worthy could now enter the temple, be sealed as families in the next life and receive eternal life with the Father. The admission that all (males) are equal in God’s sight mirrors Bible teaching; however, the teaching that dark skin is a curse still exists in 26 Mormon scriptures. Was Joseph Smith incorrect when he wrote them down as revelations from the Mormon Jesus? Many anticipate that the LDS Church is morphing toward biblical Christianity. Nevertheless, as long as Mormonism reveres Joseph Smith as a prophet, teaches that Christ failed to establish a Church that would last but Smith did, and supports his extra-biblical scriptures as truth, these teachings are far outside mainstream Christianity. Doctrines such as the nature of God, who Jesus is, the condition of humankind, the creation, salvation, atonement, marriage and eternal life are just a few of the divergent teachings. According to LDS scripture, polygamy is an eternal principle and dark skin is a curse. Mormons say they believe in Jesus. Some have even encountered him. Only Jesus can judge the heart, but given that LDS teachings contradict Bible teachings, one has to ask which Jesus? Although it came at a cost, my whole family and I ended up leaving Mormonism in order to follow the real saviour. Doctrines such as the nature of God, who Jesus is, the condition of humankind, the creation, salvation, atonement, marriage and eternal life are just a few of the divergent teachings.